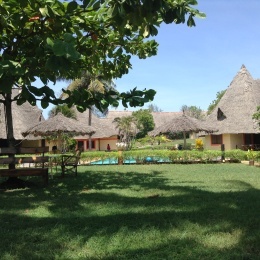 This Villa is in a compound of 4 other villas in Malaika Villas located off Diani Road in the Southern coast of Kenya a few meters off the beautiful white sands of diani beach. They offer privacy and serenity. They overlook the swimming pool and have a large well manicured lawns for relaxation. The living room is spacious with african carved hardwood furniture made with exceptional attention to details and design. Kitchen is fitted with all appliances. 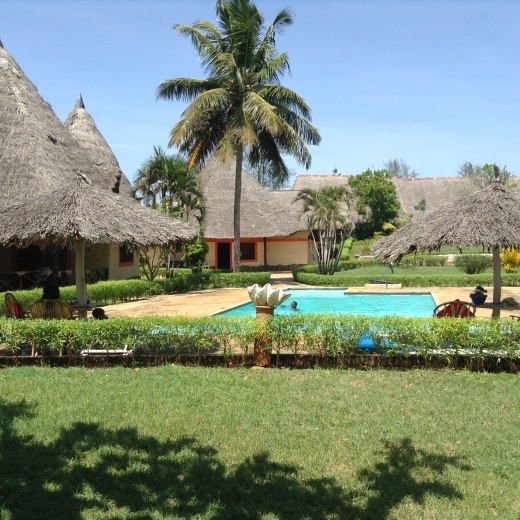 At Malaika you will enjoy that home away from home feeling. Malaika Villas is located off Diani Road in the Southern coast of Kenya a few meters off the beautiful white sands of diani beach where comfort, security & privacy matters. It is opposite the famous Almanara Resort. It is designed to make you feel at home for a day, a week, a month or more. The villas offer a beautiful swimming pool and sun beds for relaxing, trendy and well manicured lawns. As you drive along diani road to Malaika you get to feel and see the natural forestlike neighborhood full of different species of monkeys & birds surrounded with virgin land. Chale Island is 11.1KM from Malaika Villas. You can also visit Shimba Hills National Reserve. For your grocery, get them at Nakumatt Diani or Chandarana Supermarket.